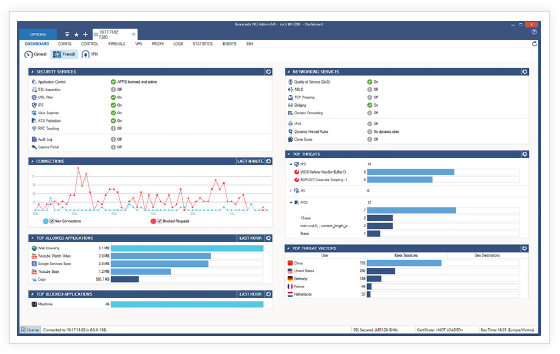 The Barracuda CloudGen Firewall F-Series gives administrators granular control over applications, allowing them to define rules for forwarding data traffic using the best respective transmission channels based on type of application, user, content, time of day, and geographical location. The Barracuda CloudGen Firewall F-Series allows organizations to prioritize traffic by limiting or restricting access to non-business-related applications and network traffic, even when encrypted. The Barracuda CloudGen Firewall F-Series Intrusion Detection and Prevention System (IDS/IPS) strongly enhances network security by providing complete and comprehensive real-time network protection against a broad range of network threats, vulnerabilities, exploits, and exposures in operating systems, applications, and databases preventing network attacks such as SQL injections and arbitrary code executions. The F-Series incorporates advanced site-to-site and client-to-site VPN capabilities, using both SSL and IPsec protocols to ensure remote users can easily and securely access network resources without complex client configuration and management. The Barracuda CloudGen Firewall F-Series benefits of the same industry-leading single-pane-of-glass central management as on-premises deployments do. Easily manage the secure VPN connections to, from, and within Amazon Web Services and the Barracuda CloudGen Firewall F-Series deployment itself. The Barracuda CloudGen Firewall can run as a virtual appliance in the Amazon cloud as a gateway device for Amazon EC2 instances in an Amazon Virtual Private Cloud (VPC). Follow the steps in this article to deploy the Barracuda CloudGen Firewall in an Amazon VPC.